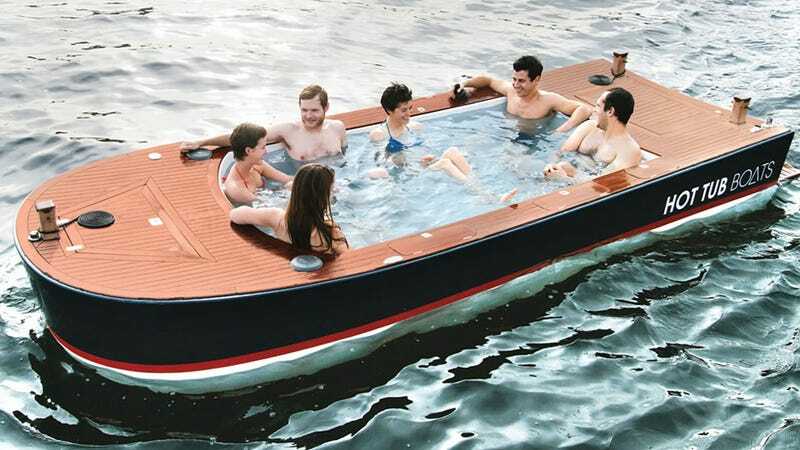 As if enjoying a leisurely cruise across a lake wasn't relaxing enough, a Seattle company has found a way to take it to a whole new level by cramming an eight-foot long hot tub inside a 16-foot boat. This is synergy at its finest, people. When the hot tub is completely filled with 104 degree Fahrenheit water—courtesy of a diesel-powered boiler—the boat weighs in at 2,100 pounds, but it still manages to float about 20 inches above the waterline. And a steerable electric motor controlled by a small joystick takes care of propulsion, bringing the craft to a top speed of about five miles per hour. So it's obviously designed for leisurely trolling, made all the more enjoyable by its 50-watt sound system and four separate coolers for your libations. If there was ever a good reason to mortgage your house to raise $42,000, this is it.